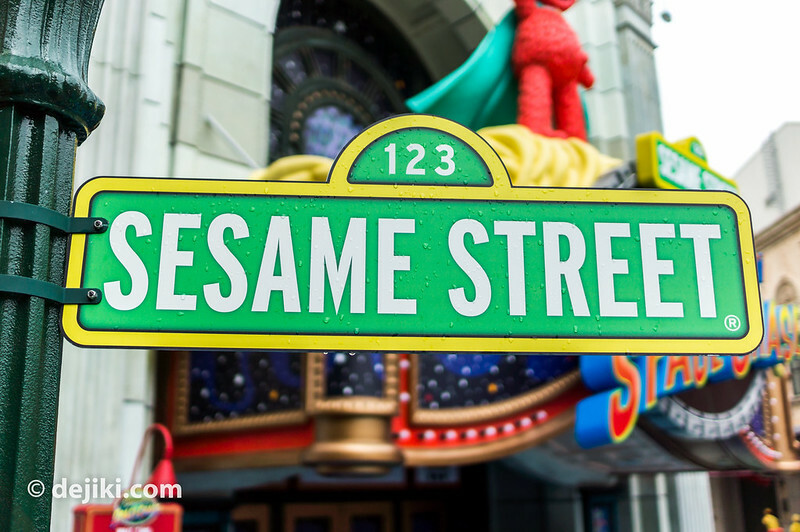 With Halloween Horror Nights 2 finally over, the next big thing at Universal Studios Singapore would be the opening of its new dark ride: Sesame Street Spaghetti Space Chase. 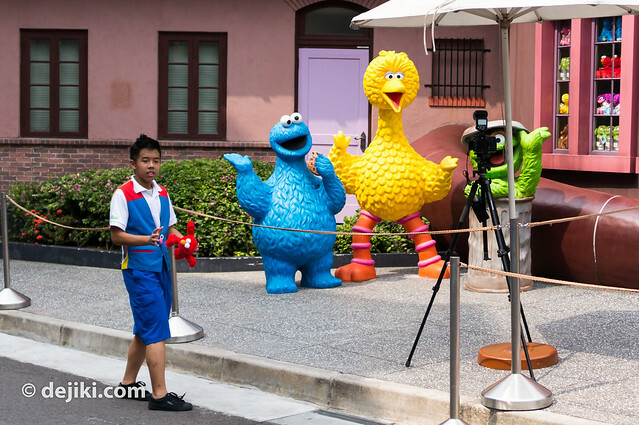 Here is the November 2012 park update and photographs from Universal Studios Singapore. This entry will be updated when new information or content is available. Check back often! No official announcements yet, but the park will be open from 10:00AM 31st December 2012 till 1:00AM 1st January 2013, as part of the SUPERNOVA COUNTDOWN Party event. Guests who purchase a ticket for 31st December will be able to stay for the countdown party. All Annual Passholders can enter the park at no charge. SUPERNOVA COUNTDOWN 2013 will feature street parties at Hollywood and New York, with hits from Adele, Lady Gaga and Michael Buble performed live by international tribute artistes. Some rides and attractions will be open all night. In addition, All-You-Can-Eat and All-You-Can-Drink add-ons are available. Prices will be posted here once they are announced. This year’s Christmas overlay is known as “Winter Wonderland”. 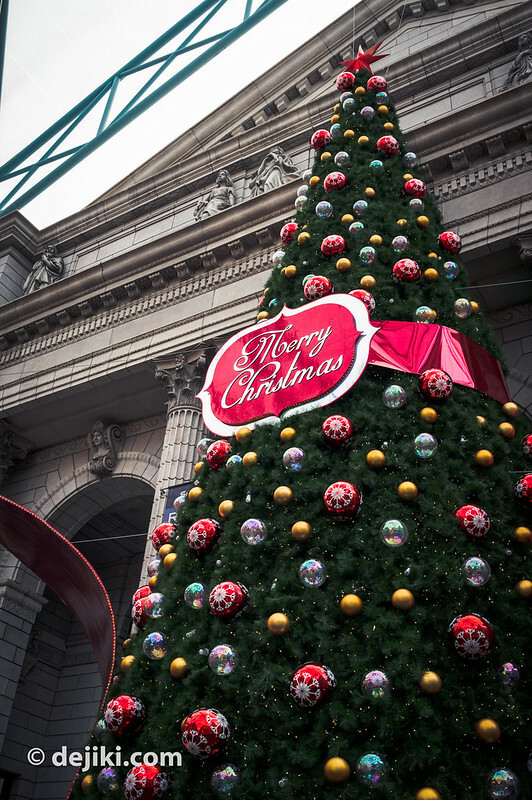 While stage shows are not performed (possibly still in rehearsal), various festive decorations are already put up. This year, the tree and stage are placed at New York zone. This makes sense for a few reasons: For the past two years, the tree was placed at the end of Hollywood Boulevard. It was not sheltered, covered the fountain, and essentially blocked the view of fireworks show for those standing in front of it. It also meant that entire Hollywood Boulevard area was insanely packed after the New Year’s Eve countdown event. 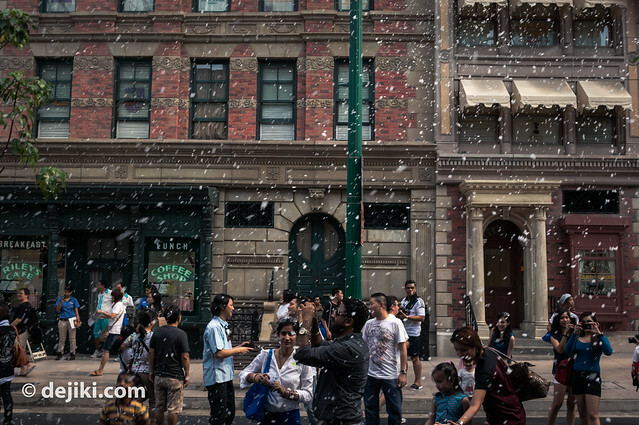 There is also a special snowfall event each day at New York. It is foam-based faux snow. 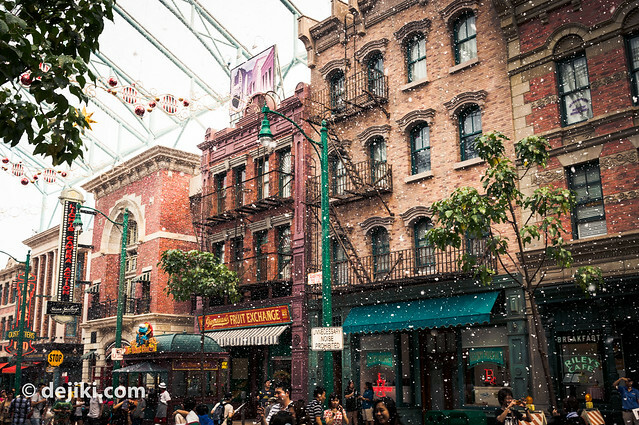 I’ve experienced this several times at Hollywood zone, and it seems that this snowfall effect works and looks better at New York zone. It feels a lot more magical and many guests enjoy the effect – many smiles and jovial photo moments. 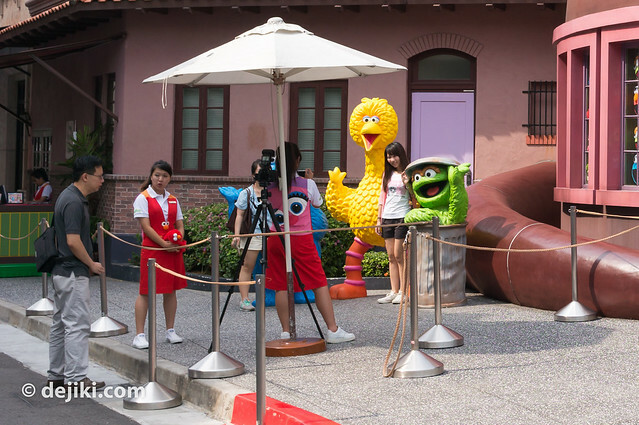 A Photo-Op Spot, featuring Big Bird, Cookie Monster and Oscar, has been set up outside the Brown Derby. 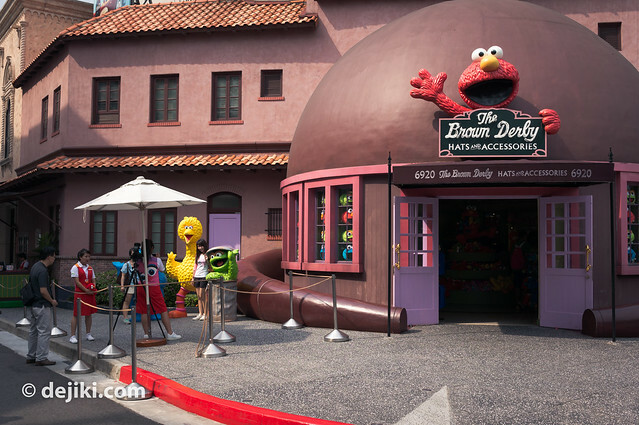 This is directly opposite the Sesame Street Ride building. The characters’ proportions and expressions look a bit off, in my opinion. Anyway, the crew members here wear very interesting and colourful uniforms, just like the crew for Spaghetti Space Chase. As usual, you get the park crew to take your photos here for free (with your own camera or smartphone) or purchase photo prints directly. 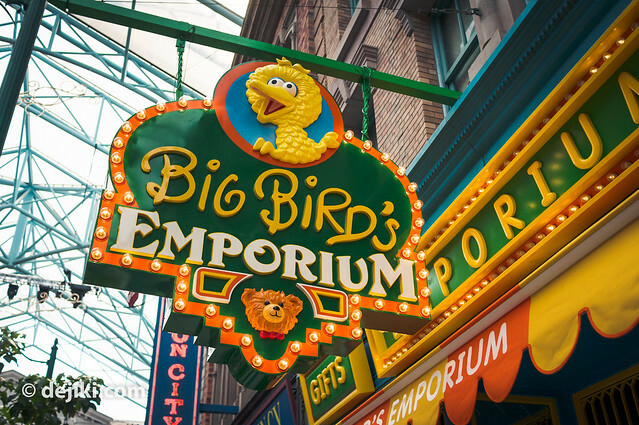 With this final piece in place, Big Bird’s Emporium is now complete. In other news, the outdoor queue for Spaghetti Space Chase has been set up again. Who knows what might happen these days. Let’s take a look at the entrance. Stroller parking (definitely important for this ride) will be at the right of the entrance. Here’s a larger shot of the wait time and ride safety information board. This ride is suspended and simulates a space flight to a faraway planet. The movement of the vehicle includes sudden tilting and acceleration. Surprise! 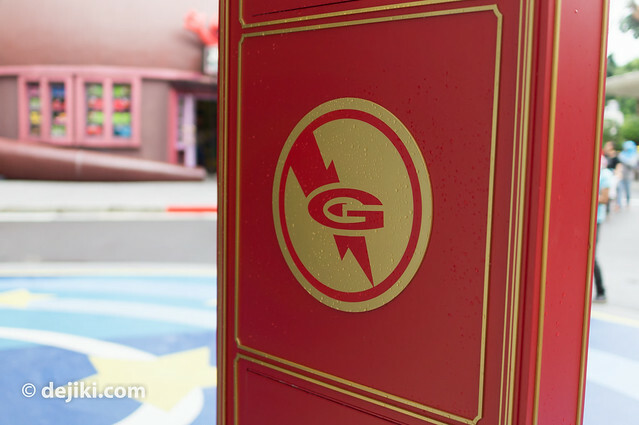 a touch of detail behind the board – the Super Grover “G” emblem. The height post is also up! 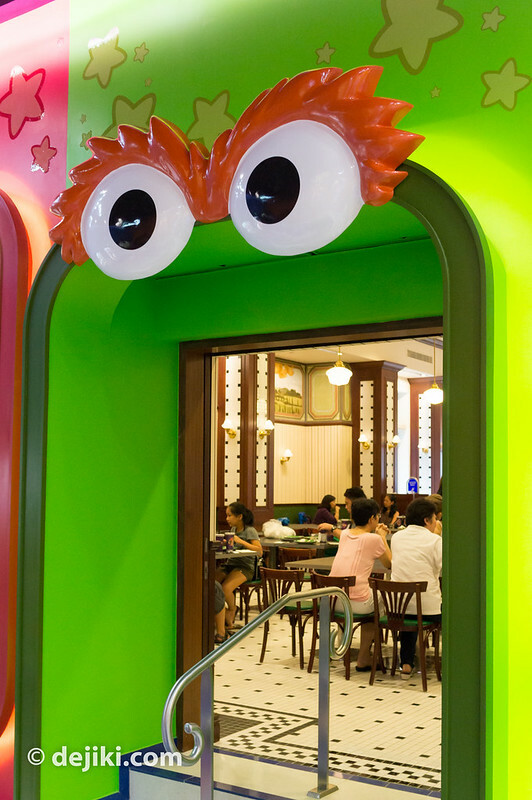 For Sesame Street Spaghetti Space Chase, guests will need to be at least 85cm tall to ride. Children between 85cm to 122cm tall must ride with an accompanying adult. Children taller than 122cm may ride alone. 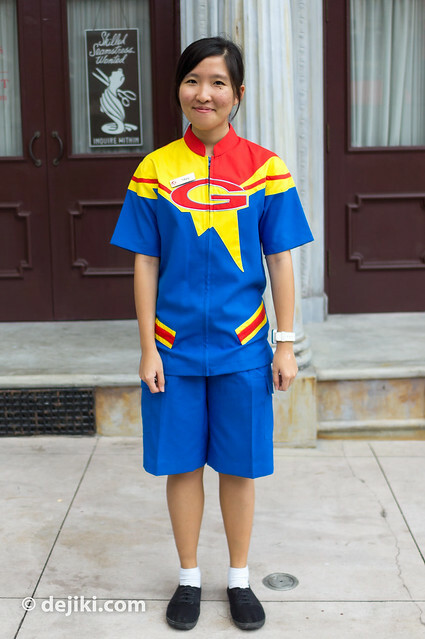 I’ve spotted a crew member wearing the new uniform in the park. 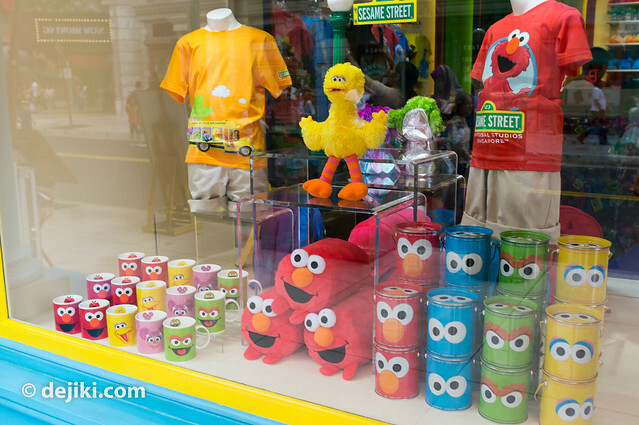 Like all things Sesame Street, the uniform is colourful and vibrant. And there’s also the Super Grover emblem. Many thanks to the friendly crew member for posing for the photo! There were as many as 7 ride vehicles beside Stage 28 – the usual place such vehicles were found. Unlike before, these vehicles were parked “backwards”. 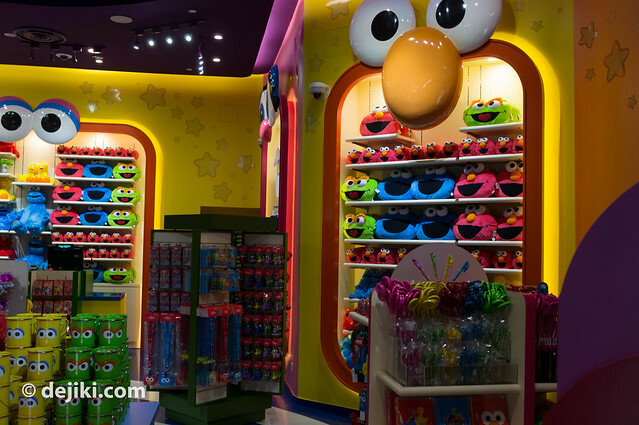 It appears that the ride vehicles are themed to Super Grover : being blue, and those lightning bolts at the sides. So yes, Super Grover. 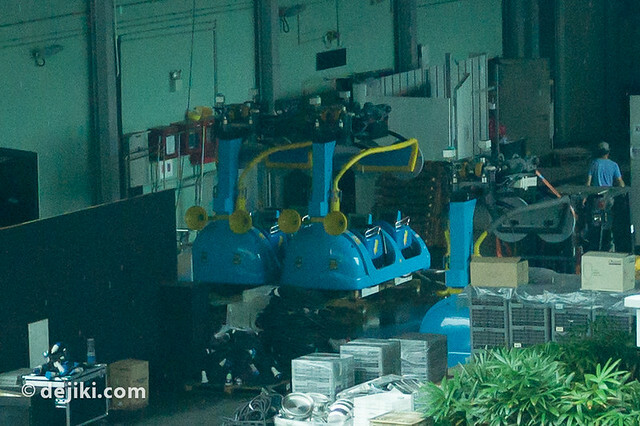 This photo shows a glimpse of the length of the ride vehicles. Each vehicle has seats for guests in two rows. Each row should accommodate only two guests, as there are individual lap bars. VERY INTERESTING: There are (what appears to be) displays for each row. Will there be some interactive element in this ride, or perhaps something will be shown on the screens at certain points of the ride? Please not let this be the simple and static “light-up” screen we see in Transformers: The Ride! The two grey/blue discs attached to the top of each vehicle are the “eyes”, filled with a ring of lights (16 individual lights, according to Luke). The yellow “funnels” at the back seem to be decorative. It looks like the seats are attached the sides of the vehicle (the blue parts with a lightning bolt) as one piece. It’s intriguing – why does the sides (or doors) have the extra two-bar railings? A wild guess: the seats might be able to… tilt. Well, I’m only assuming because the sign at the entrance mentioned “sudden tilting” and I don’t think the entire ride vehicle would tilt, given how the tracks seen so far have angular cross section (not circular, unlike those used for steel roller-coasters to create banking/tilting), and that I feel that the ride vehicle’s overhead wheels cannot support that sort of movement. The entire vehicle attaches from the top mechanical element (which goes onto the tracks) via one steel column. The ride vehicle’s half-cylinder shape also suggest that the seats may tilt. Another possible clue: There are two of those grey “slots” at the back of the ride vehicle, which might be the support bars for the tilting mechanism. This assumption leaves a bigger problem – what about the seats in front? Okay, end of random speculation time. I could be completely wrong, anyway. 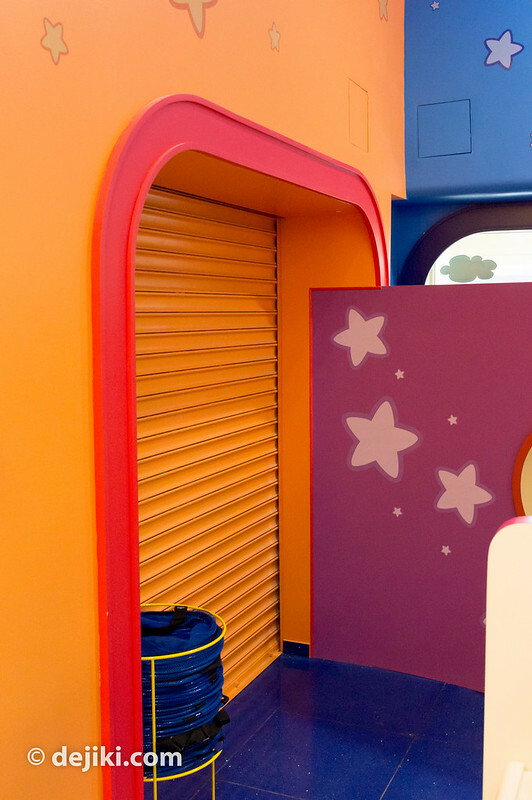 Who knows – it might be nothing but an additional safety feature because guests may lean to the sides to see more of the ride’s scene. Another question: How do guests easily get in and out of the vehicle, then? With all the information given so far (and the safety board), I think feel that this ride most likely… take place on a single level, that is somewhat elevated. Perhaps it’ll be like Peter Pan’s flight where the entire ride is elevated (and the “scenes” are below riders, built at a basement). 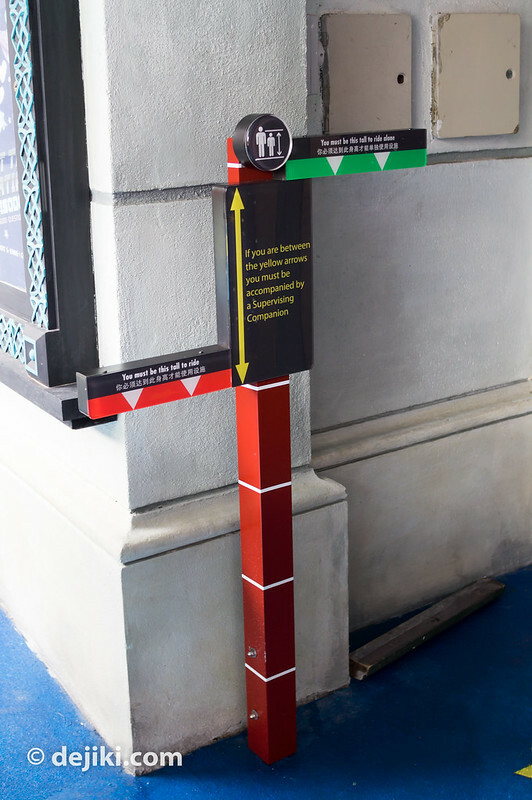 The reason for suspecting that it is only one level is because there are no elevation changes, climbing or lifting – otherwise it will need to be on the safety information board outside the ride. 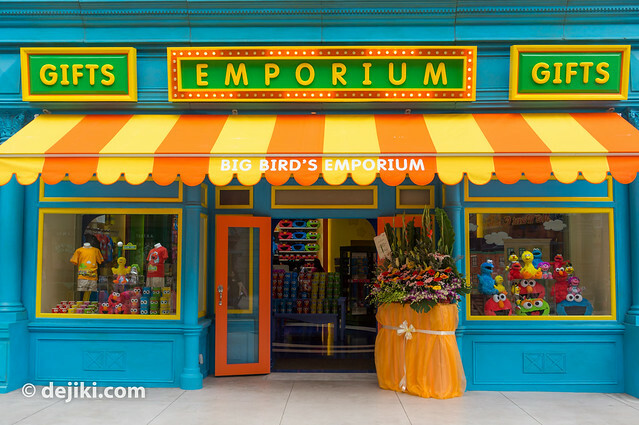 Big Bird’s Emporium is now open. And it’s so colourful inside. 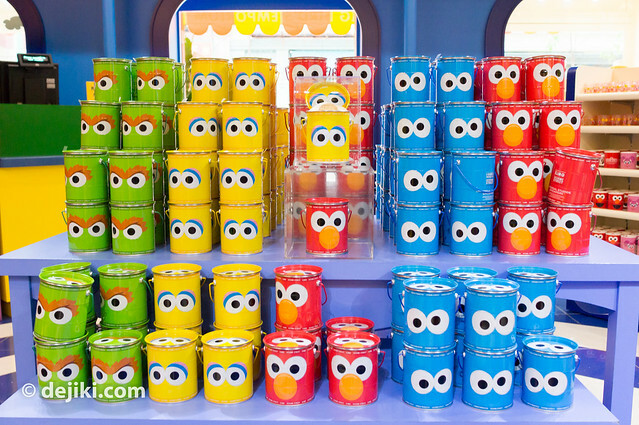 Grover / Super Grover (yellow for some reason) on the right. Sorry for the bad angle. Oscar (leads to Loui’s NY Pizza Parlor). 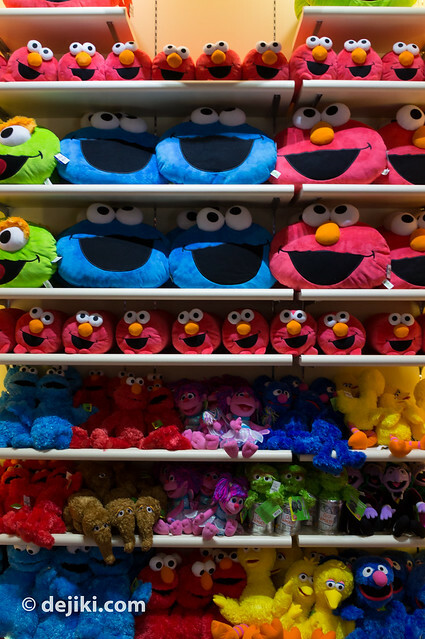 All sorts of plush toys from Sesame Street, including Snuffleupagus. 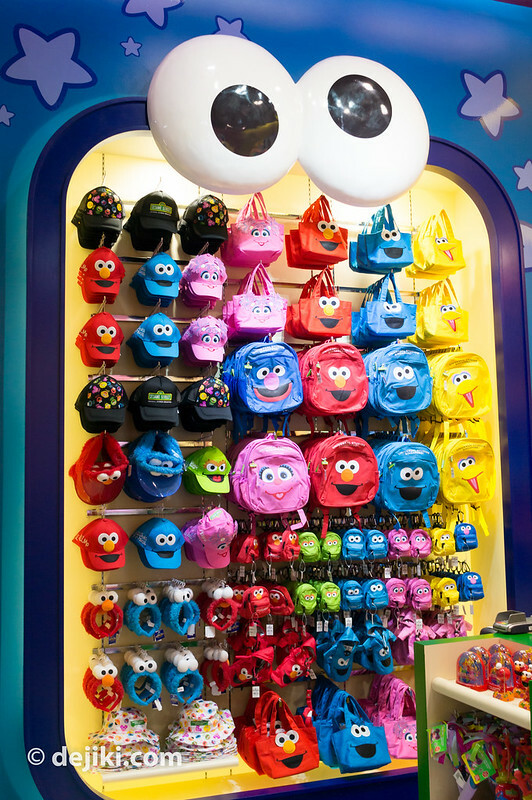 Lots of nice items, lanyards, cookie tins, sparkly cups, postcards and other stuff. The ride exit is over here (quite close to the shop’s entrance – the window on the right from outside). There’s also a checkout counter here. 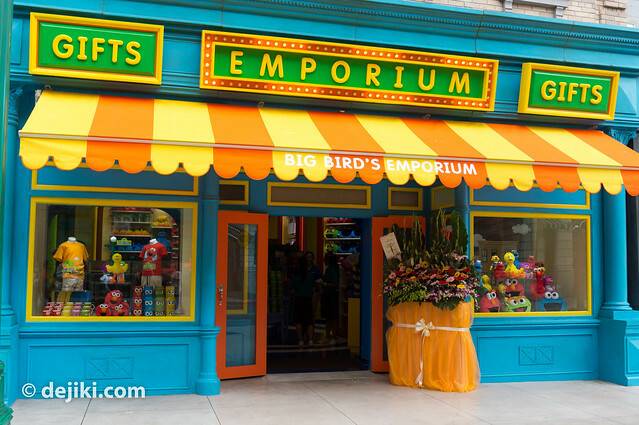 Compared to the Brown Derby, this is a better store (despite the lack of large decorative elements that the other store has) because it’s so much easier to browse. That’s a lot of retail presence. 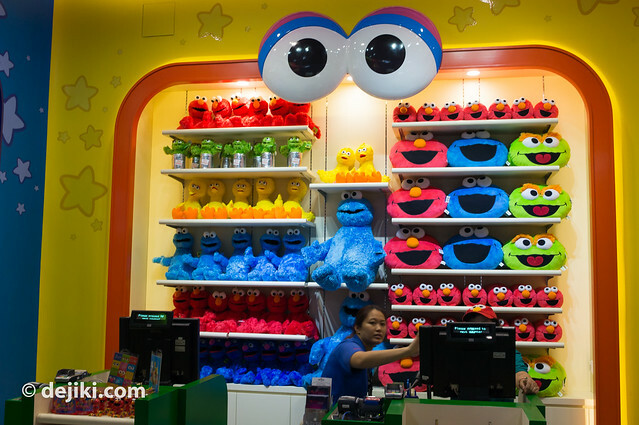 Even the merchandising for Transformers was not so pervasive – the park wasn’t joking when they said Sesame Street will be significant. Hopefully, they were serious when it comes to the actual dark ride. When will the ride be open?!?! I went to the park today and was also surprised by this! They should have made the shop look like Hooper’s Store from the TV series! We are going to Singapore August 2013. I love your Universal Studios & Marine Life Park updates. 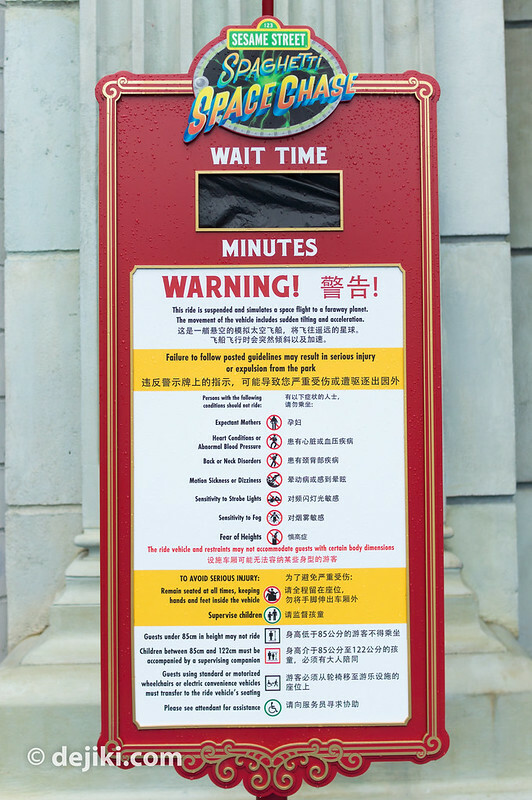 Nearer the time, please can you perhaps blog a summary of each of the main rides in the US park? Eg if I’m not good on roller coasters, which should I avoid? Thank you very much, love the blogs anyway. PS Are you going to talk about the River Safari when that opens too? Do you know when that will be? 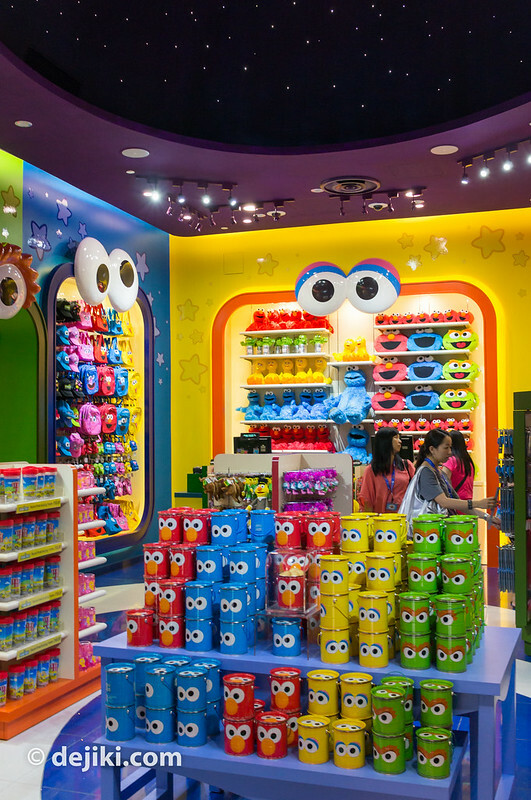 I have plans to write a guide on attractions in Universal Studios Singapore (it’s been in the works for a long time) but I believe I will have to work on it and publish it early next year. If you have any questions on the park’s rides, shows and other activities, feel free to leave a comment at any new USS Park Updates posts – I’ll always answer any questions submitted at the latest update posts. River Safari will open in Q1 2013. Giant Panda Forest, one of the attractions in River Safari, will be open later this month (29 November). August 2013 will be a good time to visit as all these new attractions would’ve been open for a while and have all its early problems (if any) ironed out. Thank you very much Dejiki for your update. Wow you are too kind! However, I believe perhaps the best way to experience a park or an attraction is to ride it without knowing anything about it (except the safety warnings). Luke, the guide will only provide essential safety information about rides. It’ll take forever to write about each ride’s storyline because a lot of reinterpretation will have to come from me. Hi Dejiki, love your posts am coming over in mid January with the family. Do you know if it gets really busy around that time? i was last there at the end of Sept 2012 and the park was surprisingly quiet which was a change. Also with the two days passes are you restricted to consecutive days or can you break it up. Mid January is off-peak season for the park. However, crowd conditions on the day you are visiting is still unpredictable – there could be corporate family days or it just so happens that several tour groups are visiting the park at the same time. 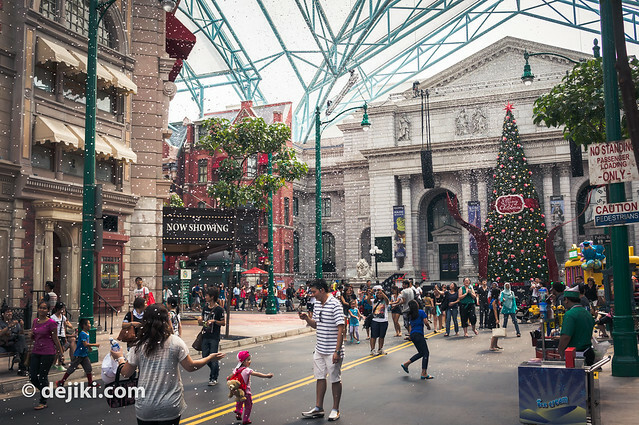 Still, you should be able enjoy the park’s attractions without too much waiting in mid January. As for the Two day passes, they have to be used in consecutive days. Hope that helps! I watched a performance today. But I did not bring my camera. It was almost identical to the one performed last year…. 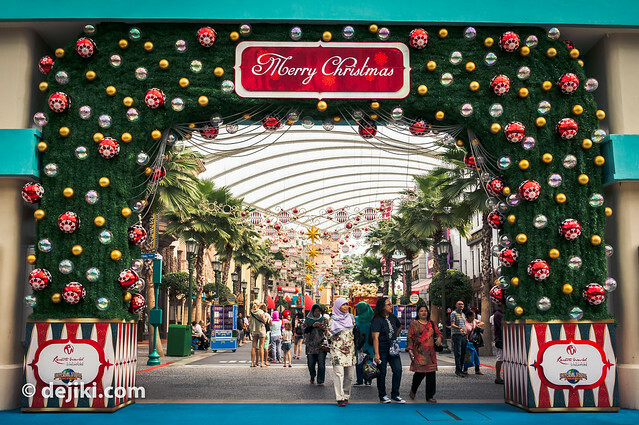 thank you for all your blog posts – very interesting for me as I will visit Singapore (and Universal Studios Singapore) for the first time at the end of January! You said the Hollywood After Party has been extended to Jan 5th – the official website says the same yet shows HAP-Dates for all of January up till the 26th! Do you personally think that’s just an error on their side or is it possible they may extend the event some more? Or replace it with something similar? Thank you for your kind words! 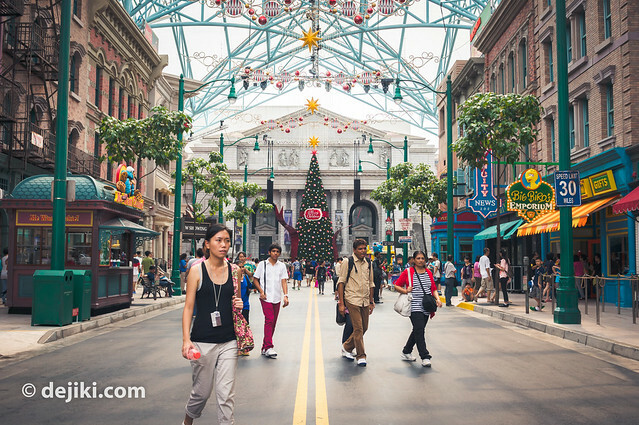 Feel free to ask me anything about Universal Studios Singapore or any other attractions in Singapore. Regarding Hollywood After Party: In most cases, the park calendar is correct. However, I will only post dates on my blog when the band performing on those dates is confirmed (which for now, is up to 5th January 2013). Unfortunately that looks like the case. The ride needs more time to test and be certified. Waaa how much does the cushion/pillow cost? Also, I might be visiting SG soon. 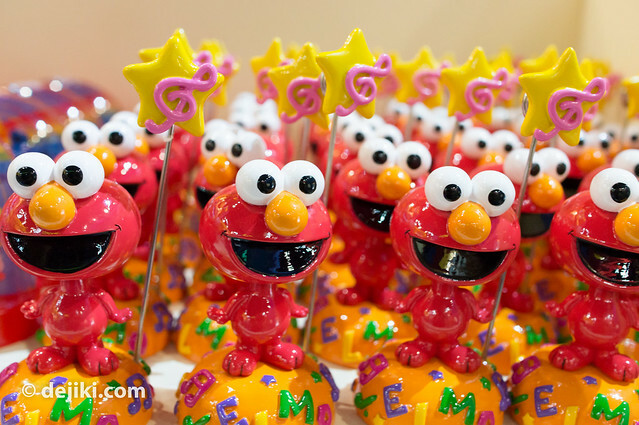 Wouldn’t it be difficult if we are to buy these stuff and drag them all around the park? 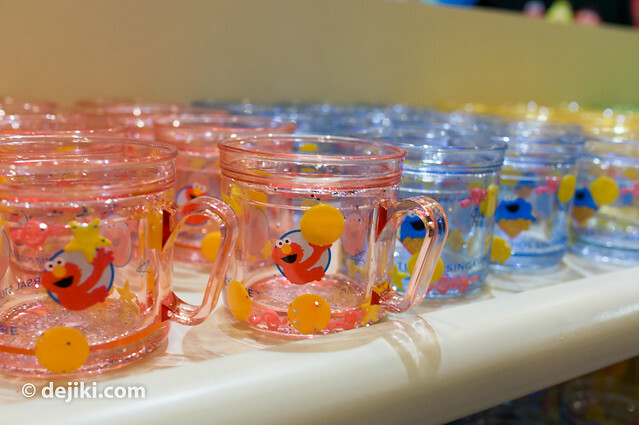 Or there are pick-up points for all bot merchandise? 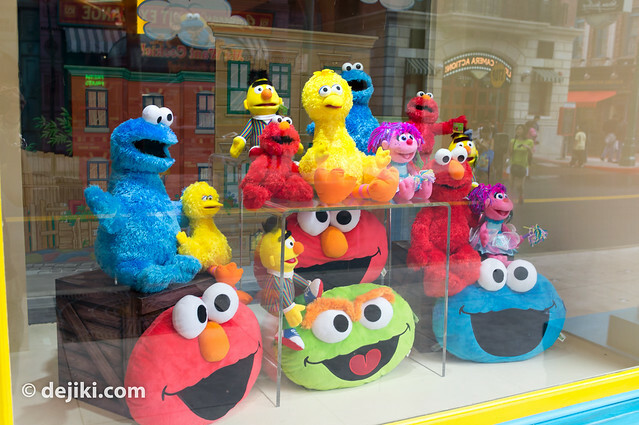 The Sesame Street cushions (character faces) cost $29.90 according to my data in July. I’m not sure if the price has changed, but should be around that price. 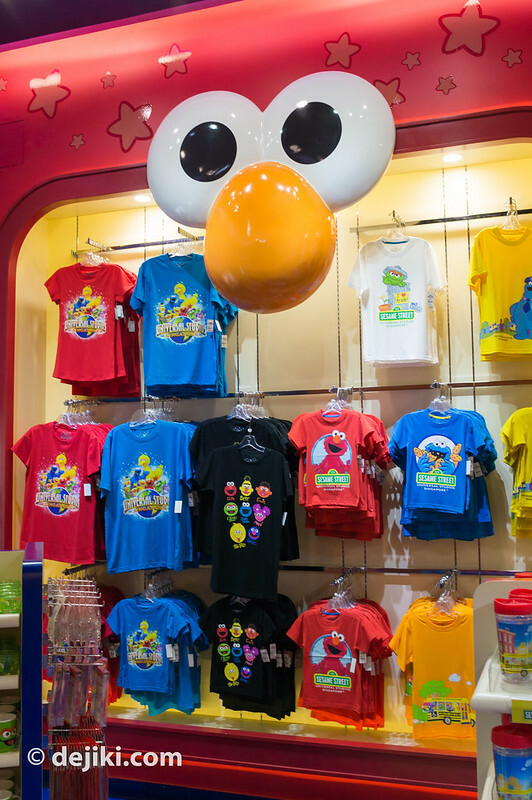 You can buy items from the retail stores in the park and have them all sent to the shop (It’s a Wrap) outside the park for pick up later. Just ask the staff at the store about it. Hi Dejiki, thanks for another well thought out post. Anyway, have you heard of test track in disney world? The interactive element in the ride is awesome! 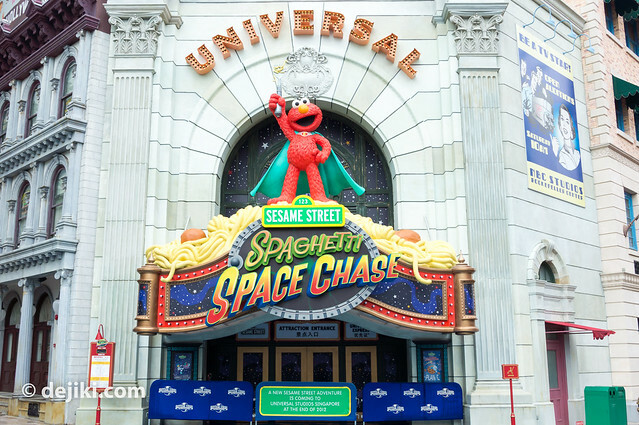 Anyway, I hope that their screens for sesame street Spaghetti Space Chase is as good as those in Epcot’s Test Track presented by Chevrolet. Lovely blog with beautiful pictures! thanks for sharing with us. 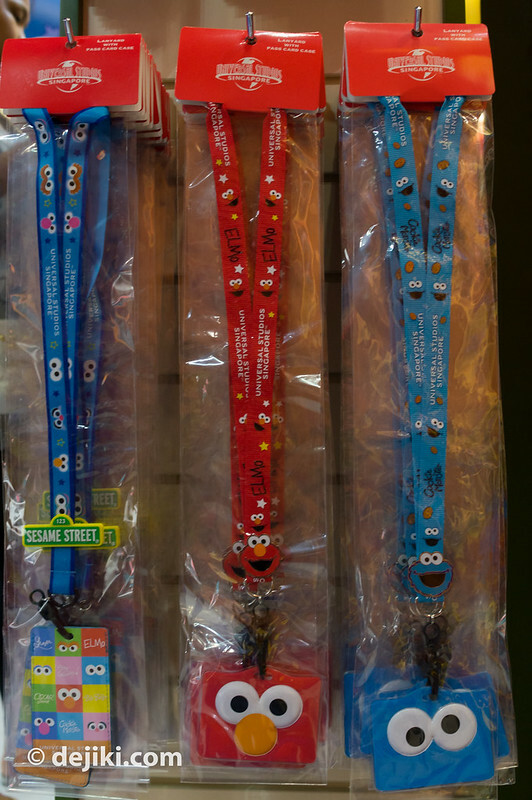 Hi for the uss Cookie Monster lanyard is it possible to hand wash it ? , cause a friend of mine bought it for me as a gift thank you for your help .